Set in a skillfully crafted alternate history brimming with the unexplored technologies of Tesla’s generation and populated by creatures of legend and nightmare, Spear of Destiny has been described as, “acres of strange.” As fitting as that appellation is, though, I think Trey Garrison’s debut novel could also be described as a worthy successor to the best tall tales of literature. It places Trey Garrison in the company of writers like Robert E. Howard, H.P. Lovecraft and even Mark Twain. I think that last sentence is a little overly optimistic, but it gives me something to shoot for in the sequel I’m hard at work on avoiding writing. Read the full review here on John’s website. Thank you, John. Now stop writing reviews and get on with your own novel, slacker. We continue the long process first-time novelists undertake to build an audience, and in the meanwhile there’s a new review of THE SPEAR OF DESTINY at the Philadelphia Weekly Press. 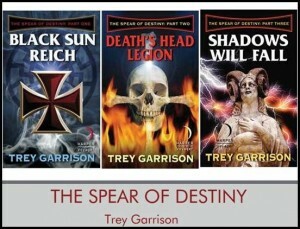 Trey Garrison has the first part of his tale of Nazis of the Black Sun Reich (electronic from Harper Voyager) searching for the Spear of Destiny. It’s only 1928 but Hitler has been in power since 1922. They are worried in the Texas Freehold, the libertarian nation that is one of six North American nations, especially when Dr. Deitel smuggles out word that the Germans are working on a way to create unkillable vampiric soldiers. Soon he is paired with a pilot, Sean Rucker, and they have to face Nazi agents in the Union States of America. This is only the first third and sets a rollicking pace… Howard Hughes and Nicolas Tesla and cameos along with several other famous people of the time, but the fun is in the Raiders of the Lost Ark shtick that makes the tale irresistible. Alas this is only the first third of the tale. Keep spreading the word. I’m hard at work on the sequel in what is my two-book deal. I’ll have an in-store appearance at Zeus Comics & Collectibles at 1334 Inwood Avenue in Dallas to promote THE SPEAR OF DESTINY on Wednesday, Jan. 30, from 1-3 p.m.
Zeus is the premiere independent comics and collectibles emporium in Dallas. Come to see me and stay for Richard Neal’s awesome inventory of comic books, action figures, art works, and collectibles. If you’re wondering where to buy The Spear of Destiny, look no further. Part 1 and Part 2 are available now, and Part Three: Shadows Will Fall, is available for pre-order now. It downloads Jan. 22, the same day of the launch party at The Free Man Cajun Cafe. Parts One and Two have gotten fantastic reviews and critical acclaim (see below), and it has something for everyone – action, adventure, comedy, romance, Nazis, cowboys, robots, and zombies. 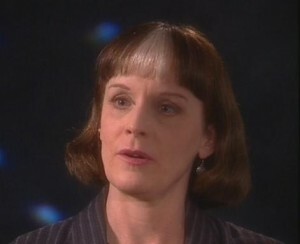 Here’s a taste of Mel Odum’s review. This review captures exactly what my goal was with THE SPEAR OF DESTINY. Garrison delivers his equivalent in this three-book run in a steampunk world that’s interesting and provides plenty of peril for its protagonists…The books are almost hitting the weekly matinee delivery schedule as well…These are books meant to be consumed, not thought about or read deeply into. They’re just fun in a grand, old fashioned way. This book is truly one of a kind, in my opinion. Containing the theme of a political background with a twist of steampunk, it will take the reader on a thrilling adventure with dynamic characters. With its twinges of humor, it allows the reader to be fully entertained…it can be a bit daunting at first, but if given the chance, this story will not disappoint you! 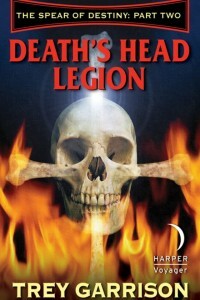 And don’t forget Part 2 of the Spear of Destiny — Death’s Head Legion — downloads Jan. 2. Part 3 — Shadows Will Fall — downloads Jan. 22. Part two of THE SPEAR OF DESTINY: Death’s Head Legion downloads Jan. 2. If you’ve enjoyed the adventures of Sean “Fox” Rucker, Chuy Lago and Dr. Kurt von Deitel so far, the adventure continues. The band of misfit heroes are in a race against a charismatic Nazi commando and a telepathic sadist to find the Spear of Destiny, a holy relic that could spell doom for all mankind. At the risk of y’all being tired of this, I’m posting another review, this one by Bookworm Babblings, which gave me five out of five for part one. It was a fun novel for me, I honestly couldn’t put it down down and it’s also a quick read. If you like adventure, science fiction, or a mix of both genres, this is the book for you. I can’t wait for book two to see what happens next! This is a review by “My Name is Sage.” Here’s a taste. Trey Garrison begins his story with a violent scene in a Vatican cathedral where we meet the frightening, Der Schadel, also known as The Skull, and his team of Nazi storm troopers. The group is after the spear of destiny, and they aren’t the only ones who want their hands on this powerful blade. Texan pilot, Sean Fox Rucker and German physician, Dr. Deitel, are an unlikely duo working together against the Nazis, but the pair work well together. They also team up with a handful of other vibrant characters who are out to stop the Germans from unleashing an unstoppable darkness across the world.